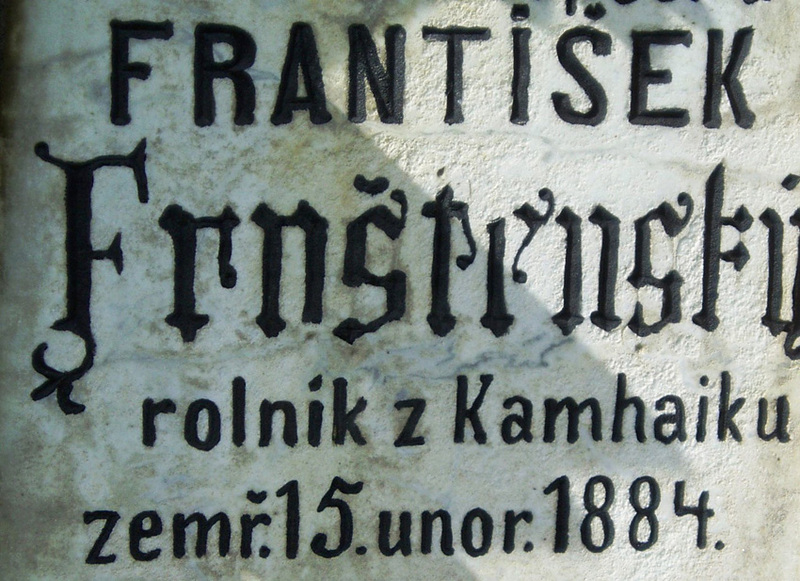 THE ORIGIN OF THE NAME "FRIŠTENSKÝ"
THE origin of the "Frištenský" surname dates back to the beginning of 14th century, originating with noblemen and later, toward the end of the 18th century, with wealthy citizens and free peasants. With the development of common law, a need to record members of society led to the establishment of surnames. In Bohemia, a law of surnames was enacted in 1780. Today's written form of the surname dates back to the middle of the nineteenth century, when a spelling reform took place, which continues to be the foundation of modern Czech spelling. Frištenský is a local name from the region of a small village of "Frýdštejn" nestled in the rolling hills of the region Liberec. Fristensky, informally "Frydstejn", "Frish", "Frys", comes from the German word "frish" (fresh), meaning swift. In what capacity first Fristensky ancestors were associated with the castle or the village is unknown. The oldest evidence is dated from 1660 found by Gustav in a christening book from the village of Radim near Cesky Brod. Another document found in the registry of the Roman Catholic rectory from Dobrichov near Kolin in 1667 lists the christening of Marie Fristejnsky, born April 24, 1661. In this record, only the name of her father, Jan Fristejnsky is cited. There is further mentioning of Jan documented in 1718, spelled "Friedsteinski". 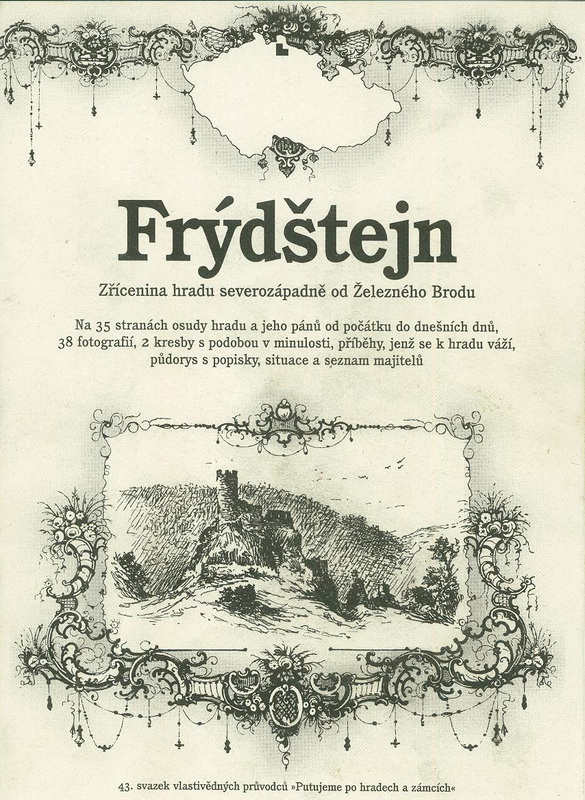 The next official document of the name "Fristensky" is of Vaclav Frištenský, born in 1786. 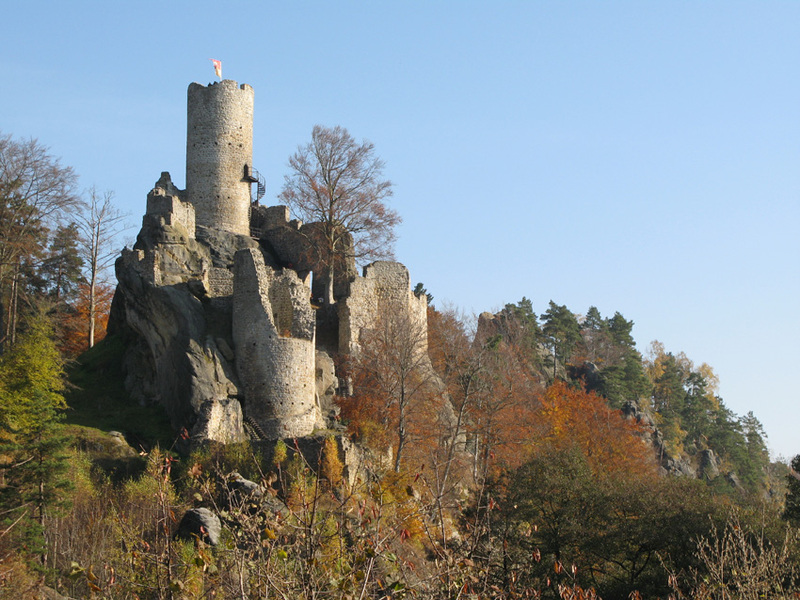 The ruin of the castle Frýdštejn is one of three castles in the region of Liberec, north east of Prague. Much is not known about the castle. When Frýdštejn was constructed, or when the fortification of was created is unknown. What is known, however, is that it was the property of the family of Markvartic. The owners of the castle were the lords of Dražice (1363) and 13 years later in 1376, the lords of Bibrštejn. The entrance into the castle is not exactly known. It is believed to be on the adjacent to the tower through the ground floor of the palace itself—known as the lord's residence. As there was little living space inside the castle, the whole barrier consisted of a series of small rooms carved out in the rock. Major dominant of the castle is a large castle tower built up on the highest rock in order to watch around surroundings. The tower is the most preserved portion of the castle. It is 50 feet high, 30 feet in diameter, and 6 feet thick. There was single entrance on the 1st floor, about 23 feet above yard level. Presently, the castle is owned by the community of Frýdštejn, a small village that sits below castle. Conservation works have been underway, despite the considerable costs, in order to keep the preserve the castle for future generations. There are more than 40,000 variations of Czech surnames. Considering that the Czech Republic has 10 million inhabitants, 250 inhabitants (including children) would account for one specific surname, however, this is not the case. Several surnames are common, and others are rare –which comprises the majority – and connected only with a few families. In the case of the Fristensky name, it only has a single lineage. The first twenty common surnames covers 6.92 % of the total population; the top forty frequent surnames accounts for 10.18% and the top 100 surnames belongs to 18% of the Czech population. The most common family name in Bohemia and Moravia is the surname "Novak" (the English translation of Newman). "Novak" indicated that one was a newcomer to a community of old village inhabitants. The second expressive distinguishing feature of surnames was the connection to landowners. Usually, they were free, independent men or freeholders among the rural population. Thus he was given a surname "Svoboda" (a free man) or "Dvorak" (a farmer having his free farm - DVUR = court, yard). The farmer who had a large plot of land was called "Sedlak." Who, according to his social status owned only a small house with scarcely any land, was called "Chalupa," "Chalupnik," "Chaloupka" (the same as cottager) or "Zahradnik" (from zahrada, meaning garden). Physical and character traits were also sources of surnames. There was an overwhelming fair-haired population in the Czech lands and a man with a dark complexion or hair was an exception. Thus the surname "Cerny" or in German regions "Schwarz" (in Czech "Svarc") came into existence. Similar is the origin of surnames describing the temperamental and physical features of the bearer: "Vesely" (a cheerful man), "Kysely" (sour or bitter). Most surnames are derived from Christian first names –with many variations, derivates – and also formed by many suffixes. The most common surnames, derived from given names are "Benes"(Benedict) or "Marek" (Marcus). Common surnames include "Urban", "Bartos" (Bartholomew), "Havel" (Gallus), "Janak," "Janecek," "Janda" (John), "Kaspart" (Caspar), "Klima" (Clemens), and "Vacek" (Venceslaus). There are Czech surnames derived from localities, regions or foreign countries. They are mostly formed by a suffix -ky, or -sky. Here are some examples: "Prazsky," meaning from Prague, "Kolinsky" (from Kolin), "Palacky" (from Palacov) or "Bilovsky" from Bilov or Bilovec. Surnames indicating a citizen from foreign country or region include "Nemec" (from Germany), "Slezak" (from Silesia), "Moravec" (from Moravia) or "Hanak" (a Moravian region surrounding Olomouc), "Slovak" (from southern Moravia or Slovakia). Surnames derived from the names of an occupation, or social status include "Kovar" (smith), "Kolar" (cart-wright), "Kadlec" (weaver), "Rybar" (fisherman) –also in the German form "Fischer" or "Fiser," "Mlynar" (translated in German to "Mueller" or "Miler") or "Tesar" (carpenter). The nature was a source of many family names. A large group of surnames was developed from the names of various animals, either resembling the physical characteristics or character feature of a man. To name a few: "Myska" (mouse), "Zaba" (frog), "Jelinek"(stag), "Jezek" (hedgehog), "Vrabec" (sparrow), "Vrana" (crow). A very interesting and unusual group of surnames is that formed from the present tense or past participle of verbs or even derived from full sentences. "Hrabal" (raked), "Koupil," "Soukoup" (a surname developed form the trade of its bearer - a dealer, buyer), "Navratil" (returned) or "Vrzala" (scraped). Often times, if an expensive thing was bought, the buyer was called "Drahokoupil."